Jesus dying on the cross and rising again are central elements of the Christian faith. The Apostle Paul described this most important set of events in 1 Corinthians 15, stating, "If there is no resurrection of the dead, then not even Christ has been raised. And if Christ has not been raised, our preaching is useless and so is your faith." It is sometimes challenging to teach children -- especially young children -- about the death of Jesus. You should use age-appropriate activities to solidify their understandings. Very young children do not fully understand the concept of dying. When you explain Jesus dying on the cross to a child who has not yet reached a reading age, focus on the loving nature and perfect life of Jesus. Walk your child through some of the miracles he performed and some of the common Bible stories to lay the groundwork for a more thorough explanation when your child gets a little older. If your child has experienced the death of a loved one, or even a pet, it can be appropriate to briefly explain heaven as being a place where you go when you die because of Jesus dying on the cross. Coloring activities can be useful when describing these events, but using a coloring sheet with Jesus on the cross might be more than small children should see. Consider having your child draw pictures of heaven with family members or pets there. Find connect-the-dots pictures that depict the miracle stories of Jesus rather than the crucifixion. Have your child make a cross from ice-pop sticks or twigs from your yard. Sing songs about Jesus's life and his love with your small child. Grade-school children can typically read from a Bible geared toward their levels of reading aptitude. Point your grade-school child to the story of the death of Jesus in her Bible so she can read it and ask questions before doing any activities. Once she has a basic understanding of the crucifixion, help her make a landscape-scene diorama in a box. You could also have her draw a picture of what she thinks happened or about the events surrounding the crucifixion. While it's important to support your child's understanding of the crucifixion with the many traditional stories from Jesus's life, be sure you give a basic explanation about this most important event: Explain the concept of sin in a careful, age-appropriate way by walking your child through the 10 Commandments as noted in Exodus 20. Once you do this, explain that everyone sins, including yourself, and that everyone who sins needs forgiveness. Lastly, explain that to a Christian, the way to obtain forgiveness is to turn from sin and trust that Jesus dying on the cross made it possible to obtain forgiveness for sins. Tying activities such as coloring pages, word searches and crafts to the 10 Commandments helps children understand why the crucifixion happened and will deepen your child's understanding of the Bible. Middle school children can be more inquisitive and ask deeper questions than younger children. As such, it can be helpful to cover more that surrounds the event of Jesus's death in your activities. For example, have your middle school child research how there were predictions that Jesus would come to save us hundreds of years before it took place such as in Psalm 22. Have you child write an illustrated newspaper article that explains how Jesus fulfilled this prediction. 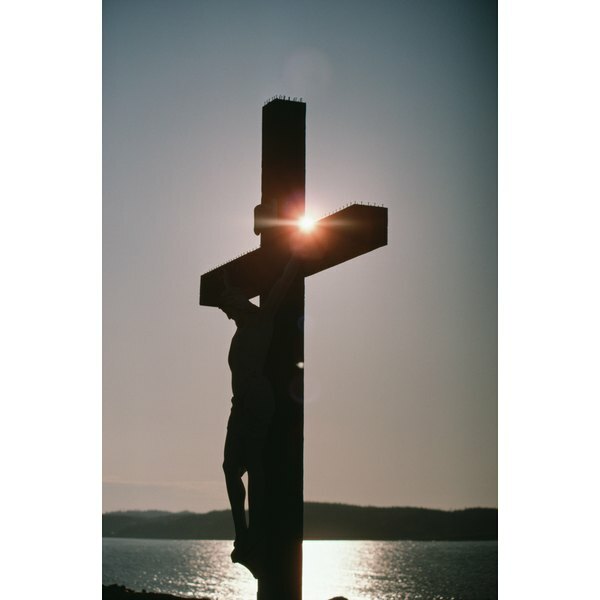 Help your child design a dramatic interpretation of events surrounding the crucifixion that he can present with his friends or siblings to your family or church. The children can also videotape the drama and post it online as a way to teach them evangelism. If your child is tech savvy, have him design a digital presentation using software, such as PowerPoint or Prezi, explaining the event. A very common and useful activity to explain the events leading up to the crucifixion as well as the whole Easter story is by making a beaded bracelet. While there are many variations of this craft, typically it will begin with a bead symbolizing the covenants God made with mankind. The next bead will be white symbolizing how man was created sinless. Next, a black bead will symbolize the fall of man when he sinned in the Garden of Eden. A red bead symbolizes Jesus's blood shed on the cross and a black bead symbolizes his death. A green bead might symbolize Christ rising from the dead with a final knot at the end signifying your acceptance of Christian beliefs. You can add other beads to symbolize other things, but be sure that the presentation centers around Jesus dying on the cross, the most important event in Christian history.